Fantastic Hotel, in Great Location , Welcoming Helpfull Staff , Clean with Character and Charm. 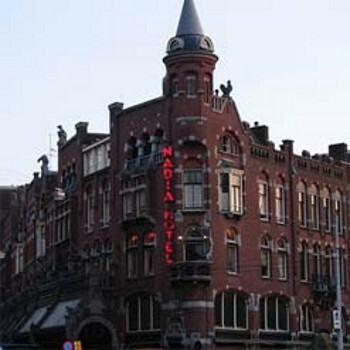 I booked the Nadia Hotel for a group of seven using the hotel's website and found that the manager answered any e-mail enquiries very quickly and was extremely helpful. The Hotel is well situated with trams buses and canal boats almost a few metres from the entrance. Dam Square and many of the toutists attractions were within walking distance. Ann Frank's House just a few miutes walk away. We used the tram and buses to and from the Railway Station and a tram to Van Gogh Gallery. We had one triple deluxe room, a twin deluxe room and a twin room and all were clean, had en- suite WITH HAIRDRYER and well equipped with tea making facilities. We knew that hotel rooms in the centre of Amsterdam are compact, stairs tend to be steep and we had opted for this hotel knowing it did not have a lift/elevator and we just took out time going up and down the stairs. We were a mixed age group ranging from the age of 25 -60 years. Our luggage was carried up and down for us which was a bonus. The hotel was fully booked during our stay, so I advise you to book well in advance. Every member of the staff was extremely friendly and helpful and recommended the best places to go to eat and places to visit. The rooms cleaned and fresh towels every day. The breakfast was Continental style self service in a large room overlooking the canal. The choice of food was limited to various rolls, breads, croissants, jams and spreads and cheese but adequate as you could have as much as you wished and numerous refills of fresh orange juice, teas and coffees. On our day of departure we stored our luggage in the locked baggage room and we were allowed to use the breakfast room as a meeting point and were offered refreshments. There is so much to do and see that a weekend was not long enough and we all hope to go back and EVERYONE in the group said they would definitely book the Nadia Hotel again!